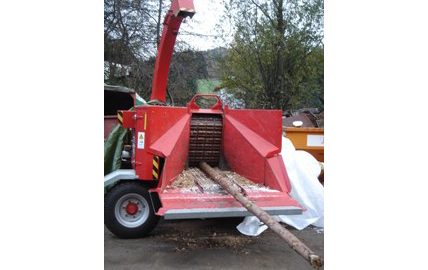 Starchl drummed and screened wood chippers have been developed over the last 40 years hand in hand with the wood-chip sector in Austria. 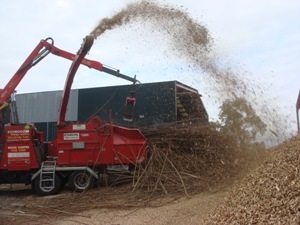 Starchl produce a range of wood chippers; from small hand fed chippers to large industrial scale, crane fed machines. 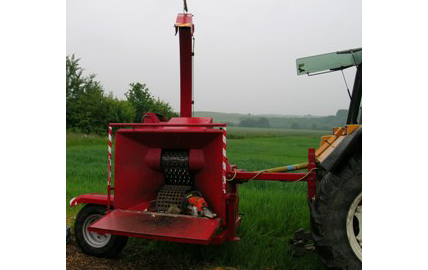 The smaller wood chippers have a low table and an intake allowing hand feeding. Mid range “Mk” chippers are all designed to be crane fed, where the number indicates how wide the intake is in cm, e.g. the Mk 74 has a 74cm wide intake. 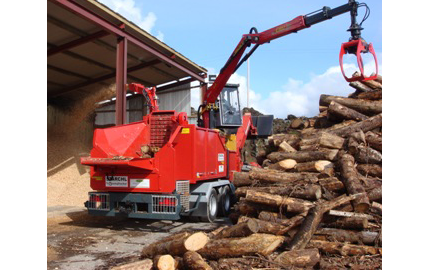 The largest wood chipper is the U-1200 with a 120cm wide intake. All chippers can be built to be PTO, Engine or stationary and Electrically Driven. 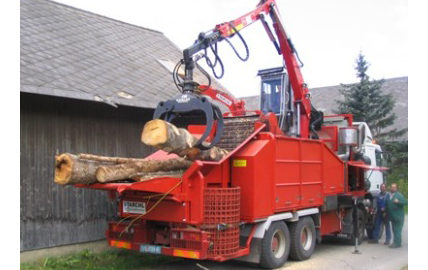 This also makes them ideal for Sawmills or similar industries where a mobile machine is not needed. Further information on specific chipper models can be accessed from the right hand column of the page. Starchl drum wood chippers are designed and manufactured so that each machine is uniquely engineered to suite your personal requirements. We will work hand in hand with youand the Starchl engineers to find the best solution for your needs. The Starchl machines are renowned for their unique unbelievablylow maintenance requirements resulting in high work performance. The unique cut and hammer action and special design of the drum, combined with a good weight to rpm ratio, makes the chippers easy to drive, achieving high outputs and low fuel bills. 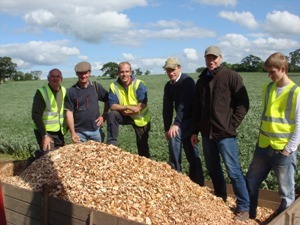 One set of blades can effortlessly produce 5,000 to 10,000 tonnes of woodchip; putting the Starchl chippers in a league of their own when it comes to maintenance and performance. The machines and blades are designed to allow easy sharpening with an ordinary angle grinder where different angles on the blades allow the chipper to be optimised for “specific” materials. Screens are available in all sizes to allow for the production of chip from G30 right up to G100. Screens can be changed in less then 2 minutes, saving valuable time and hassle. The Starchl range has no problem producing the best quality chip from challenging materials such as Coppice Willow or twigs. 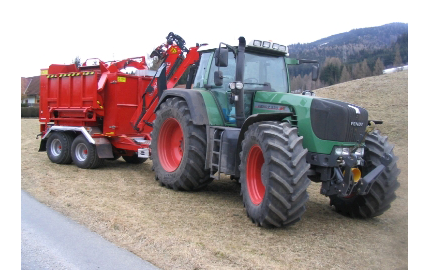 The optimised rotor system allows for materials such asBrush, Straw and Miscanthus to be chipped. The drum chippers can also be used for the reduction ofcompost and various waste materials. Small pieces of mild steel such as nails and screws should not damage the robust chipping blades. 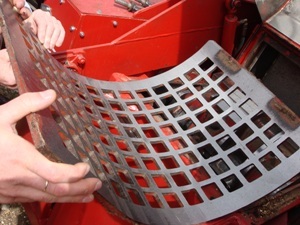 Specially designed drum and screen chippers are also available for chipping pallets. 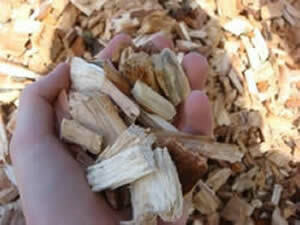 The Starchl wood chippers produce top of the range chip, perfect for the wood biomass sector. Chip sizes can be selected by simply changing the grading screen, allowing chip sizes for small domestic boilers G30 / G50 right up to G100 for large industrial scale boilers. Longer pieces of “twigs”, often found with other chippers when chipping branches brash and willow can cause a lot of trouble for domestic boilers often resulting in the need to screen the chip before use. These “twigs” simply do not exist with the Starchl machines.